Pebble crusher generally belongs to the category of impact crusher which is frequently used by us in the crushing operations. It usually applies to the secondary crushing procedure in the whole production line. Pebble crusher has a wide application in water and electricity, artificial ballast, crushing and many other fields to process a variety of materials smaller than 500 mm. Pebble crusher's crushing principle is basically the same with that of hammer crusher, all making use of high impact action to achieve the crushing of materials. But the structures and working processes of these two pieces of equipment are different. 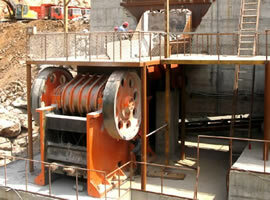 This article is mainly to introduce the three mechanisms of crushing of pebble crusher. Free impact crushing takes advantage of impact energy to crush pebble and other hard rocks and ores. After entering into the crushing chamber, the materials will suffer the impact from the high-speed plate hammer and other material particles. Materials are broken and thrown out at the double speed of the rotor. By the way, most of the dust is generated in this process. Pebble crusher makes the materials gain an extremely high speed under the impact effect of the plate hammers on the high-speed-rotating rotors. The materials will be shot into and reflected from the counterattack board, with its gravity center tracking along the mechanics and then strikes on the back board. Counterattack plate is the dominant factor to control the flow direction of the materials. 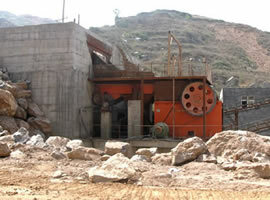 Materials enter into the crushing zone of plate hammer, the large blocks among which will be milled by the high-speed-rotating plate hammers and shot out. In addition, if the materials after having experienced the above two crushing manners still haven't been broken or greater than the discharging mouth in size, then they will be milled and crushed by the high-speed plate hammers at the discharging port again.